In 2012 the US age groups were evenly distributed at a population of about 20 million for each five year age group. As the population ages, about 4% of the population is lost between 20 to 39 years. However, that life expectancy is made up by a rise in longevity between the ages of 40 to 54. Afterwards the population starts declining at the age of 55 to 59 up to 28% losses at the age of 74. At the age of 75 life expectancy gains for seniors over the age of 85. SOURCE: U.S. Census Bureau, Current Population Survey, Annual Social and Economic Supplement, 2012. 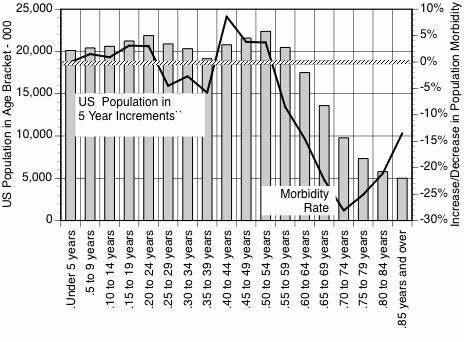 Implications: Life expectancy of the US population is not a linear trend line but varies from a decline during the rising maturity (ages 20 to 39) followed by a 10-year rise while reaching full maturity (ages 40 to 54). The surprising finding is the abrupt reversal from a 30 year morbidity decline after the age of 59 to a rise in life expectancy after the age of 75.